It appears that guitarist/vocalist Dave Keller didn’t just drink the Memphis kool-aid but that the New Englander cheerfully chugged it down. A goodly number of the originals here could have fit quite nicely somewhere on the classic Willie Mitchell-produced sides of the ‘70’s for artists such as Syl Johnson or Ann Peebles. 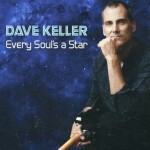 And Mr. Keller’s pipes might have landed him his own feature as well. The title track is a standout as are “Old Tricks” and “This Is Gonna Hurt”. His sly take on the Aretha Franklin hit “Baby I Love You” ain’t too shabby either.